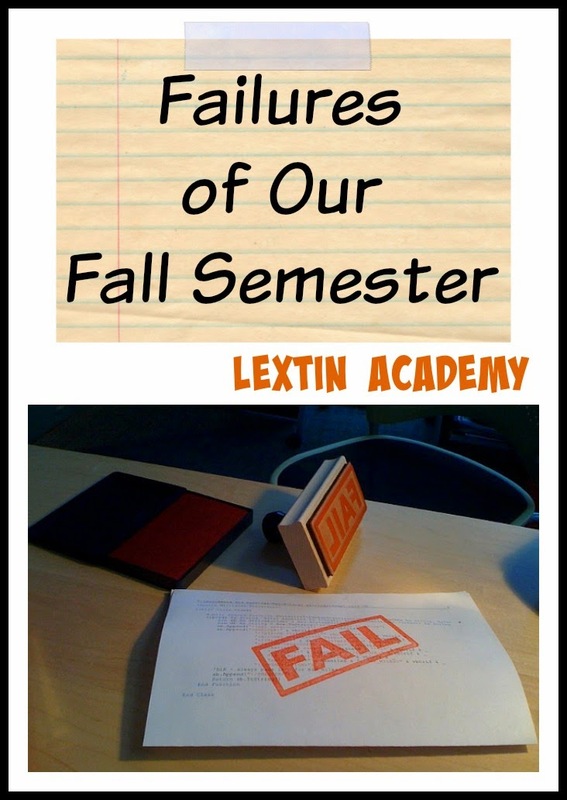 While we’ve had a great fall semester there have been a few fails. I’m going to have to reevaluate a few things and make some changes before the new semester. The biggest fail this school year has been my attitude. Yes, I’m the biggest problem in my homeschool right now. I have been feeling tired, burned out, and just a little bit like a failure. Therefore, my semester has been difficult because I struggle to maintain the right attitude and find joy in learning. I’m going to have to work to find the positives during our day. I need to recapture my excitement for watching my kids discover and explore. Because I’ve not had a good attitude or even the slightest excitement about the new school year, I’ve seriously lacked motivation. Some days I fantasize about crawling right back in bed and shirking all my homeschool and motherhood duties. I haven’t felt like plowing through another math lesson or hearing the same word sounded out for the tenth time. I dread the science experiments and avoid all the history projects. I feel ready to quit at almost any given moment. This year the arts have really fallen by the wayside. We rarely get to art and we have skipped piano practice entirely. Ouch! It hurts to admit that! By the end of the day I can’t imagine pulling out art supplies to paint or draw with pastels. I don’t want to think about the clean up. And for music, I haven’t felt like I’ve had the patience to listen to the same simple piano songs with all the same wrong notes every day. We’ve also skipped any formal artist or composer studies. We’ve read nothing and listened to nothing. I haven’t loved the geography program that I chose for Curly so we have done zero geography. I had hoped to spend this school year learning the location of the continents and the major countries of the world. Nope. Hasn’t happened. I’ll be lucky if my kids can find China, England, Brazil, or Canada. I felt like the program required too much time to plan and I didn’t have time to glance through each week’s lesson plan and choose what we would be learning. It also felt scattered to me. So, I’ve put it on the shelf and tried to look the other way. So, I gave up on Latin for Curly. While I loved the program we were using I could not keep Latin and Spanish straight. I decided we would focus all of our time on Spanish right now and branch into Latin in either 4th or 5th grade once we have a more solid Spanish foundation. Curly has been very involved in science this year. I can’t say the same for Tiger and Bee. I’ve read a few science books to them but that’s about it. We haven’t done any formal science or any experiments. Not that those things are necessary, but my kids find them fun and I want to include them in our day. My plan was to work through Song School Spanish with Tiger and Bee and I haven’t once cracked open the book. We haven’t listened to the CD one time either. I really want to expose them to Spanish and make sure they practice for a few minutes each day. That has not happened for us. I haven’t found an extra moment in our day to open the Spanish materials and get started. I had planned on doing fun projects with my littlest girls as well as learning letters, shapes, colors, and counting. Well, I have been entirely uninspired and haven not planned out fun learning activities. Our preschool time usually consists of us just doing something fun (like painting toe nails) or whatever simple project I can put together on the fly. I have been totally disorganized in my planning and implementation. We haven’t done any holiday crafts or any history projects. I have boards full of Pinterest ideas for every possible holiday and history topic but I have not felt compelled to collect all the supplies, make a huge mess, and then clean it up. I have conveniently skipped anything in our curriculum that takes more than a few minutes to make or clean up. I have refused to buy any extra supplies. I know that the kids enjoy a few messy projects in our school year but I have overlooked them entirely. I have had a few fails this semester. I’m not going to spend time dwelling on them, feeling guilty, or stressing. I’m going to move forward with a slightly modified plan. But I’m also going to extend myself some grace. I know we’ll have a few fails in our next semester as well. What can I say? We are a work in progress here. Gosh, Lexi, you have an incredibly ambitious program going on here. I'm not surprised that you feel like crawling back to bed and hiding. My heart goes out to you! Thank you for being so honest. We've had some failures here too. My five year old needs more time and I new to reevaluate reading programmes for my struggling reader. We've rather ditched Spanish in favour of reading in English which may be a good thing not a fail. Thank you for sharing this Lexi. For the past few weeks I have felt like picking up the phone and calling the school and enrolling my daughter in public school. "I can't do it" has been going over and over in my head. But then I read your post, and realized that it is time for me to move forward and start "I can" do it thinking. Thank you for inspiring me! I have felt the same as you on some days, Lexi. I, too, have a lot of little ones to deal with. You spend a good part of your energy feeding, cleaning, and helping them with life, much less school. We are in a good routine right now and quite honestly it took me letting go of so many subjects. I'm slowly moving toward a more Charlotte Mason and less Classical model during these early years. On really bad days, I try to remind myself that they won't remember the Latin lessons, but they might remember me being grumpy. Thanks everyone. I have had some struggles this semester but we are finding a new routine. And yes, it's best to drop things in favor of surviving and enjoying your kids!